Q. Can the converter be used to convert code from VB3, VB4, & VB5? A. Technically...yes. First the code needs to be converted to VB6 though. Our consulting service can help you do that. A. Please click the "Pricing" link above. If we run any promotions, we'll be sure to email them if you have provided an email for a free trial. Q. Are there different licenses for different sized projects? A. Yes. If your projects are smaller, you'll only need the smaller license. Please see the Pricing link above for license details. Q. Can the converter always convert code to be used without any need for a developer to touch it? A. We shoot for 95% conversion. The more complex projects are, the more need there will be for one of your in-house developers to finalize the conversion. We can also finalize it with our in-house consulting service. Please see the Consulting Services link above. Q. I have no in-house developers due to outsourcing and layoffs. Can Avotova help us finish the final touches? A. Yes. We offer a per hour development finalization service. You can also outsource your VB6 apps to us and we will convert, finalize, and support the apps remotely. Please see the Consulting Services link above. Q. Can you handle converting government projects? A. Yes. Consulting services are required due to security concerns. Contact us toll-free at: 833-AVOTOVA (833-286-8682). Q. Control arrays are no longer supported in VB.Net...can our code still be converted? A. Yes. The converter builds special code to make most functionality seamless. Please refer to the Control Array videos. Q. Can apps be converted to Visual Studio 2016? A. Yes. 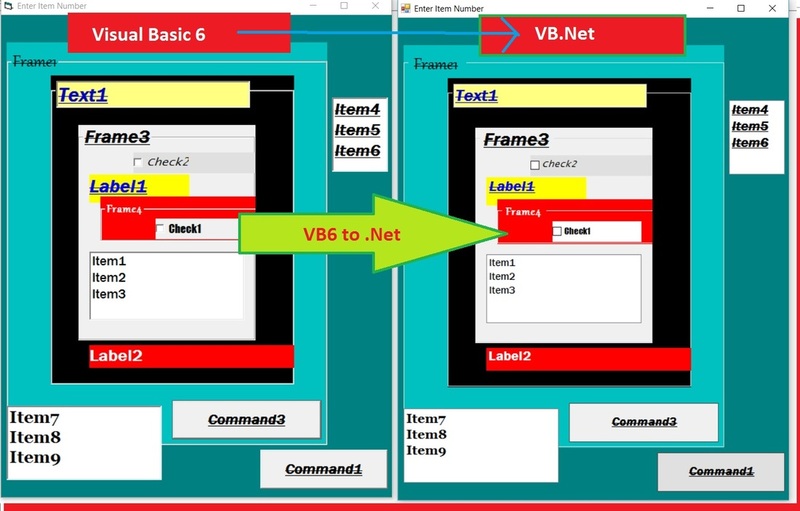 The projects are converted to native VB.Net 2010 which can be upgraded to newer versions of Visual Studio. VB.Net was a huge departure from VB6. Once your code is converted to VB.Net 2010, it should always be able to be upgraded in newer VB.Net versions. Q. If I need a better license, can I have the price pro-rated based on my old license? A. Yes. If you buy a license then decide later you need a better one, we will give you a full credit based on the number of days remaining in your old license. For example, if it was a 12 month license and 6 months remain, we would provide a 6 month credit of the cost of your old license toward the new license. It allows you to start with a smaller license and find the one that is right for you over time. Q. Our apps have images inside them but we don't know where the original images are. Can the embedded images be used? A. Probably. The converter extracts data from the FRX files. As long as you have all the source files with an FRX extension and can compile the project in VB6, it should not be a problem. The converter will extract all images from the FRX even if they are not used in your VB6 project. Typically they are embedded in ImageList controls. Q. We only have the compiled executable and no source. Can you convert it? A. Unfortunately, no. The original source code is required. Contact us by clicking the Contact Us link above. • Same look and feel! • ​We are always making it better!